Successfully Added Car Bluetooth Clip-On Rearview Mirror with Hidden LED Display to your Shopping Cart. Rearview Bluetooth mirror with FM transmitter, the absolute safest and easiest way to communicate while driving on the road. Not all Bluetooth car kits are created equal. Yes, most of them do function similarly. However, the main differences have to do with the ease of use and overall convenience. And that’s what makes this Bluetooth mirror so great-- it’s just so much easier and more convenient to use than your standard Bluetooth car adapter. That’s because this Bluetooth mirror uses a high quality mirror that works just like your standard mirror, but with a twist. The mirror has a hidden LED display that shows you the caller’s phone number and related information. But unlike cheaper Bluetooth mirrors, this one uses a non intrusive red LED that uses single line text to display messages, rather than a full “block” of text that blocks your view like cheaper models do. This Bluetooth mirror is extremely simple to use too. It attaches quickly and securely using a spring loaded clamping system and has a built in microphone with two speakers. It also comes with a detachable Bluetooth earpiece for added convenience, while the built-in FM transmitter enables you to listen to calls or music from your Bluetooth enabled cell phone directly on your car's speaker system. 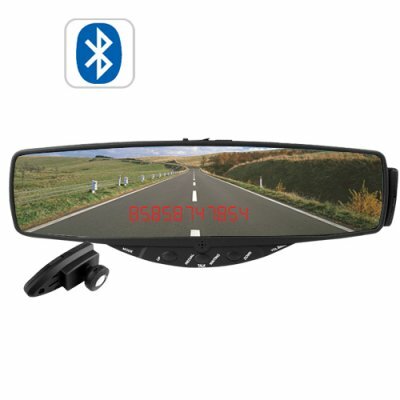 For safety and convenience, very few products compare to this wholesale priced Bluetooth rearview mirror. Order your sample today while supplies last and we’ll ship out your order within 24 hours and even include our 12 month guarantee! this is a life saving device it also stops you breaking the law.